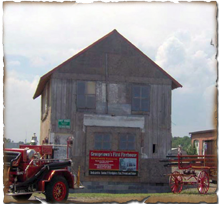 Starting Saturday, May 4, The historic Georgetown Train Station and Georgetown's First Fire House will be open for tours the first Saturday of the month through September. Times will be from 11 AM to 1 PM and attendees can view the various historic items, as well as, enjoy the model train displays. All are welcome and there is no admission charge. On Saturday evening, December 22, 2018, HGA held the last of its three "Christmas at the Train Sation" events for this year. A large crowd of well over 100 attended and enjoyed Santa, the model trains, great food from Marilyn's Catering, the wonderful historic displays and beautiful Christmas music by the Georgetown Grace Methodist Church Choir under the direction of Ron Howard. Click on "More Info" below to enjoy several pictures of people enjoying the festive evening. Approximately 50 children came to see Santa on Saturday, December 8 at the Georgetown Train Station. Total attendance for this event was approximately 90. Dan Tabler entered children and adults with Christmas songs on his auto harp. Christmas at the Train Station will continue Saturday, December 15 from Noon to 2 PM and Saturday, December 22 from 6-8 PM. All are welcome and admission is free. HGA is looking to add members to its Executive Board. The board meets the first and third Wednesday from September to May and the first Wednesday from June-August. The meeting starts at 8:30 AM and is only about an hour in length. 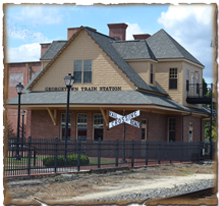 We would love to have a few more individuals who would want to get involved in the plans and programs of Historic Georgetown Association. If you are interested in becoming more involved with HGA, or would like more information, please come to one of our board meetings or contact the HGA President, Martin Donovan by email at martinbdonovan@aol.com. Thanks in advance! Scouts from Troop 95 Enjoy a Spin on "Lil Toot"
Scouts from Boy Scout Troop 95 performed community service by helping out at the HGA Open house on Saturday, September 1. We appreciate our Business members! HGA wants to thank all our Business and Organization members for their support. Please click here to see a list of these great businesses and organizations that serve our community!